Why did I make this ridiculous top, you may wonder? Two reasons - one, I wanted to avoid decreases and maximize the striping effect of Biscotte & Cie's beautiful dye work, and two, I wanted to play with an idea for closing off the top of a hat by knitting it onto straight needles. If you turn it so the flap runs down the side of your head, you can fold a high ponytail into the back point. And if you're short a tea cosy for that special event, you can use the Pocket Top! 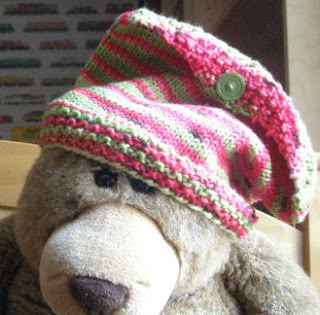 If you get to the top and don't like it on you, frog it back and reknit it using Valentine Freebie #2, Flower Pot. View .pdf of Pocket Top Hat. If you don't mind, I would like to put a link to your blog on mine !! !